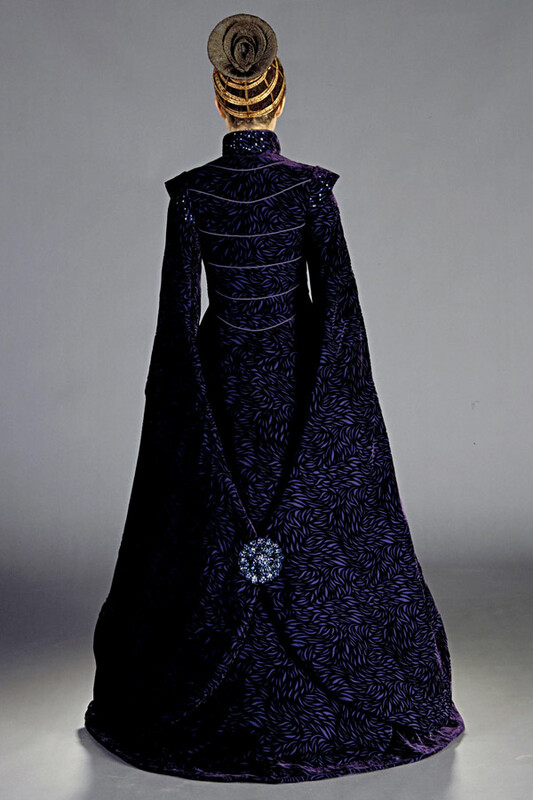 The velvet coat used for this costume seems to be modeled after a Spanish Surcoat. 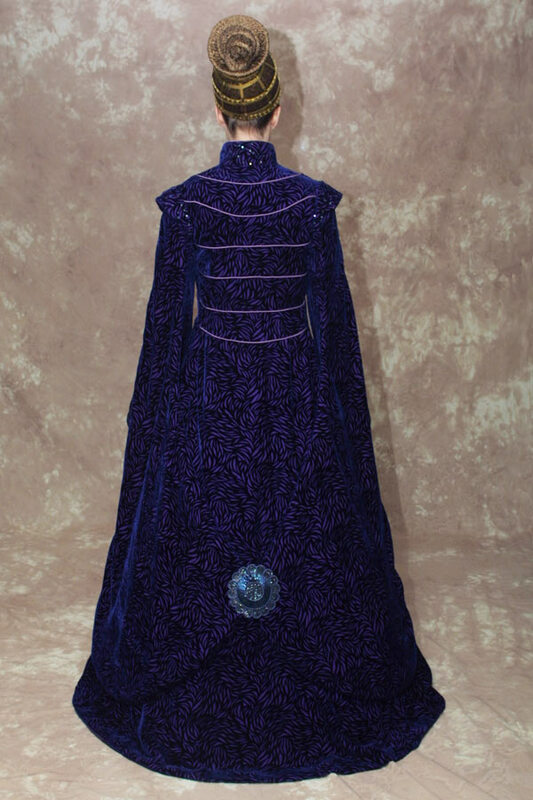 It features long pocket style sleeves, seams finished with piping, and black iris sequins adorn the collar and shoulders. PATTERNS USED: The end result is a pattern that I draped and drafted myself. I did start out with The Mantua Maker No 1500-2 "Spanish Loose Gown" and Butterick 3345 for the bodice of the coat. However, my pattern is completely different than the Mantua Maker pattern (it's nice as a reference - but not usable as is) and the Butterick pattern provides a nice starting point as a block for the bodice. 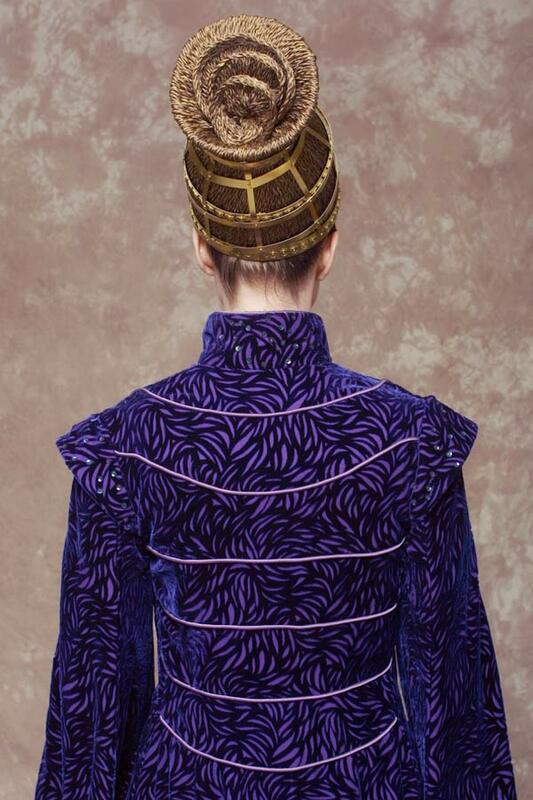 FABRIC - The "flame" patterned burnout silk velvet used on this costume can be obtained from silk connection. It is only available in black and white and must be dyed. (See velvet dye notes below). 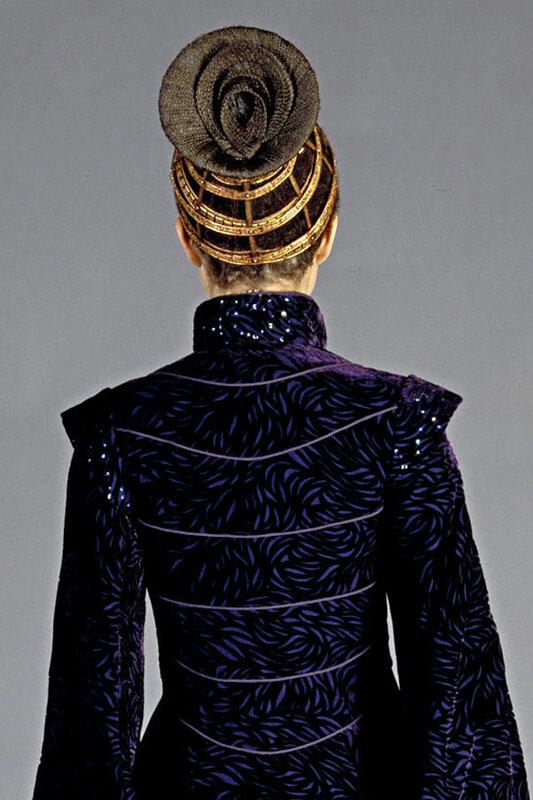 The coat in the movie is lined with a crinkled fabric (perhaps silk). I chose to use a crinkled satin polyester from Britex. The results turned out differently from my tests - when I rinsed the fabric in the washing machine the red tones bled out of the fabric leaving the velvet pile a navy blue. I tried to fix the color by redying the blue velvet in a 2/3 solution of pure ultraviolet - but again the red tones bled out in the rinse and the pile is much bluer than the real costume fabric. Perhaps a combination of midnight blue, ultra violet, and black would have been better (black would have toned down the ultra violet)? Maybe Rit dyes would have given better results? 13 yards of fabric was more than what is needed to make this coat. However, I'm very glad I overbought because I ended up having to recut all my bodice and skirt pieces. It was almost enough fabric for 2 coats! If only I had enough to recut my sleeves which needed to be redrafted as well. Flatlining The Velvet - The velvet requires flatlining in order to give it the structure required for the bodice, as well as to hide the seam allowances that otherwise show through the sheer silk velvet. The silk velvet is much too flimsy on it's own and lost it's shape when trying to add piping to all the back and front seams of the bodice. Cotton would have worked well for flatlining the bodice, but cotton was too stiff for flatlining the skirt and sleeves. 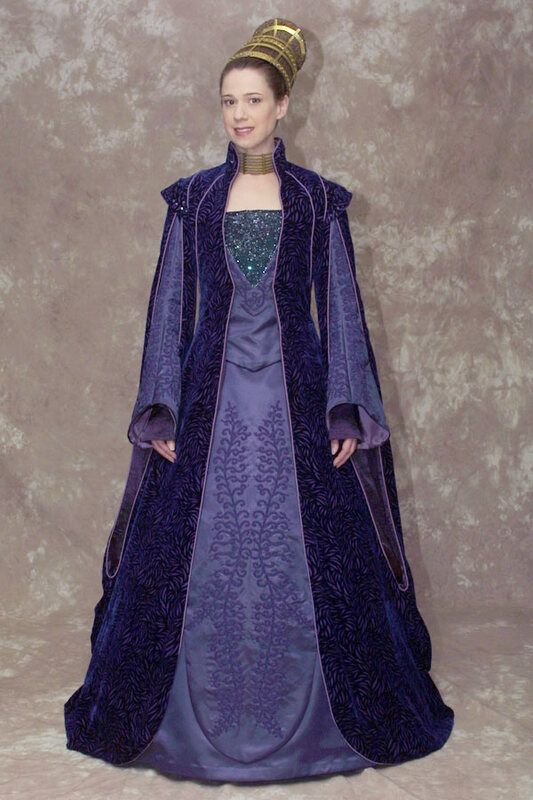 I wanted the layer under the sheer cut velvet to match on both the bodice and the skirt, so I opted to flatline the entire coat with polyester lining fabric. I simply added an ultra thin layer of iron-on stabilizer to the bodice pieces to keep them from losing their shape. A medium to light weight stabilizer was used on the collar and the shoulder 'wings' as well. The drawback to using polyester lining and iron-on stabilizer together is that the seam allowances became quite bulky once the silk piping was added. 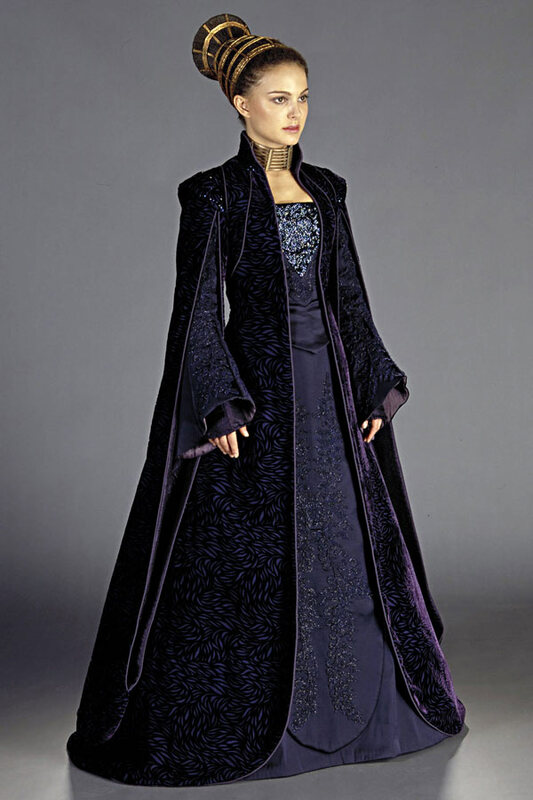 If I were to do this again I would make an attempt to find a cotton fabric and a satin lining fabric that matched in color - flatlining the bodice with cotton and the flowing sleeves and skirt with the polyester. 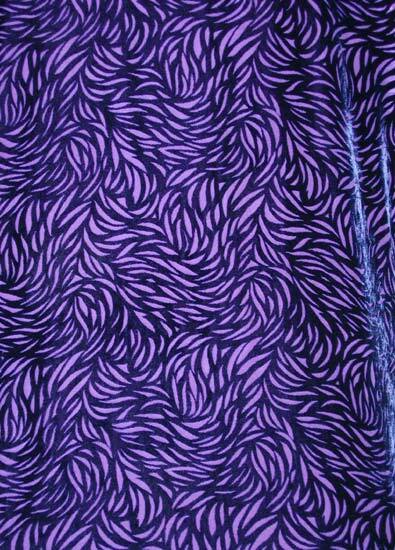 Piping - Piping was made using cording covered with biased cut strips of silk. The piping was basted onto all of the seam allowances by hand, then stitched firmly in place with a zipper foot. Finally, the seams were sewn together with a zipper foot. Making alterations to this coat is time consuming and difficult, because the piping has to be ripped out, moved into a new position, and stitched all over again. Sequins and beads - Black Iris sequins matching those used on the bodice and brooch were added to the collar and shoulder wings. Blue Iris seed beads are sewn on top of the center hole of the sequin to keep it in place. Hook and eye bars - A total of 4 small hooks are added to the front edge of the coat bodice just under the piping, and they attach to eye bars that are placed on the front of the dress bodice to keep the coat in place. They help keep the fitted coat flat against the body, as well as keeping the front edges of the coat from dragging too far backward when one walks. Thanks to Maggie at Padawan's Guide for use of the Star Wars costume photos.